The prices of solar power are beginning to correspond with the less expensive fossil fuel-based electricity in several parts of the world. However, the clean energy source still continues to account for just more than 1% of the global electricity mix. Photovoltaic (PV), or solar cells, which transfer sunlight into electrical energy, play a significant role in enhancing solar power generation throughout the entire world. Researchers are still experiencing difficulties in improving this technology. For instance, producing solar cells with an extremely high efficiency that converts a considerable amount of sunlight into electrical energy that can be used at extremely low costs still remains a challenging task. Researchers from the Masdar Institute of Science and Technology and MIT have discovered a way to handle this apparently difficult situation between cost and efficiency. A new solar cell has been created by the team, and this cell connects two varied layers of sunlight-absorbing material in order to yield a broader range of energy from the sun. This device is known as a “step cell,” because both the layers are positioned in a stepwise manner. The team also used a cost-effective, novel manufacturing process for the step cell. The step-cell concept developed by the team is capable of attaining theoretical efficiencies going beyond 40% and estimated practical efficiencies of 35%, thus motivating the team’s key investigators, Masdar Institute’s Ammar Nayfeh, associate professor of electrical engineering and computer science, and MIT’s Eugene Fitzgerald, the Merton C. Flemings-SMA Professor of Materials Science and Engineering, to focus on planning a startup company for marketing the solar cell. Fitzgerald, who has been responsible for developing a number of startups such as 4Power LLC, Paradigm Research LLC, and AmberWave Systems Corporation, believes that the step cells will be all geared up for the PV market within the next year or two. The researchers presented their very first proof-of-concept step cell in June at the 43rd IEEE Photovoltaic Specialists Conference in Portland, Oregon. The findings have also been reported by the team at the 40th and 42nd annual conferences and in the IEEE Journal of Photovoltaics and the Journal of Applied Physics. Conventional silicon crystalline solar cells, which have been publicized as the industry’s gold standard based on their efficiency for more than a decade, are relatively inexpensive to develop. However, these solar cells have not proved to be efficient in converting sunlight into electricity. Typically, solar panels produced from silicon-based solar cells have the potential to convert between 15%and 20% of the energy obtained from the sun into usable energy. Silicon’s bandgap feature is partially the cause for its low sunlight-to-electrical energy efficiency. This property prevents the semiconductor from converting higher-energy photons, such as those released by yellow, green and blue light waves, into electrical energy. It is only the lower-energy photons, such as those released by the longer red light waves that are converted into electricity in an efficient manner. Scientists have analyzed a variety of semiconductor materials, such as gallium phosphide and gallium arsenide, in order to harness more of the higher-energy photons obtained from the sun. Efficiencies higher than silicon have been reached by these semiconductors, and the highest-efficiency solar cells have been developed by layering varied semiconductor materials on top of each other and then fine-tuning them so that each material is capable of absorbing a different piece of the electromagnetic spectrum. Theoretical efficiencies of up to 50% can be attained by these layered solar cells, but their expensive manufacturing process has indeed limited their use to niche applications, such as on satellites, where high costs are not much significant when compared to high efficiency and low weight. In contrast, the Masdar Institute-MIT step cell can be developed at a portion of the cost due to the fact that a vital component is fabricated on a substrate that is capable of being reused. Thus, the device could help enhance commercial applications of high-efficiency, multijunction solar cells at the industrial level. 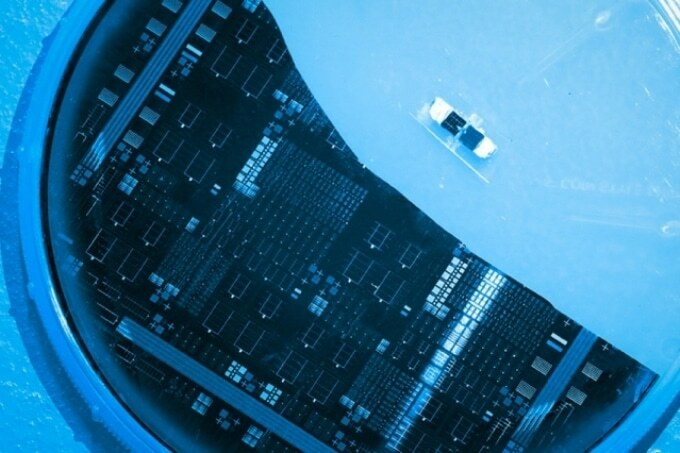 The step cell is developed by layering a gallium arsenide phosphide-based solar cell comprising semiconductor material that first absorbs and then efficiently transforms higher-energy photons, on a cost-effective silicon solar cell. The silicon layer appears like a bottom step, and this intentional step design permits the top gallium arsenide phosphide (GaAsP) layer take in the high-energy photons (from yellow, green and blue light) leaving the bottom silicon layer free to take in lower-energy photons (from red light) not only sent through top layers but also transmitted from the whole visible light spectrum. We realized that when the top gallium arsenide phosphide layer completely covered the bottom silicon layer, the lower-energy photons were absorbed by the silicon germanium — the substrate on which the gallium arsenide phosphide is grown — and thus the solar cell had a much lower efficiency. By etching away the top layer and exposing some of the silicon layer, we were able to increase the efficiency considerably. Abdul Hadi, working under the guidance of Nayfeh, performed simulations based on experimental results in order to determine the geometrical configuration and optimal levels of the GaAsP layer on silicon to produce the highest efficiencies. The team’s initial proof-of-concept solar cell was based on her findings. Abdul Hadi will continue to support step cell’s technological development as a post-doctoral researcher at Masdar Institute. The MIT team created the GaAsP, which they executed by growing the semiconductor alloy on a substrate made of silicon germanium (SiGe). “Gallium arsenide phosphide cannot be grown directly on silicon because its crystal lattices differ considerably from silicon’s, so the silicon crystals become degraded. That’s why we grew the gallium arsenide phosphide on the silicon germanium — it provides a more stable base,” explains Nayfeh. The issues involving the silicon germanium under the GaAsP layer is that SiGe absorbs the lower-energy light waves even before it arrives at the bottom silicon layer, and SiGe does not transform these low-energy light waves into current. The tandem cell is fixed together instead of being developed as a monolithic solar cell in which all layers are grown on a single substrate. Due to this, the SiGe can be removed and repeatedly reused, which thus reduces the manufacturing costs. “Adding that one layer of the gallium arsenide phosphide can really boost the efficiency of the solar cell but because of the unique ability to etch away the silicon germanium and reuse it, the cost is kept low because you can amortize that silicon germanium cost over the course of manufacturing many cells,” Fitzgerald adds. Fitzgerald assumes that the step cell positions itself well into the prevailing gap of the solar PV market, between the extreme low-efficiency and high-efficiency industrial applications. The increase in volume in this market gap demands a reduction in the manufacturing costs in the future. This research started as one of nine Masdar Institute-MIT Flagship Research Projects, which are extremely significant projects involving students and faculty from both universities. The MIT and Masdar Institute Cooperative Program enables launching the Masdar Institute in 2007. The partnership of these two institutes in the research field addresses global sustainability and energy issues, and also aims at developing research and development capabilities in Abu Dhabi. Looks like a great breakthrough.